JEWELL — Gilbert was adamant, it was not going to let Conner Hill beat it at the free throw line as the clock ticked perilously close to triple zeroes inside a raucous gymnasium Saturday night. The Tigers succeeded in one respect: Hill didn’t beat them. But Cole Berg did. 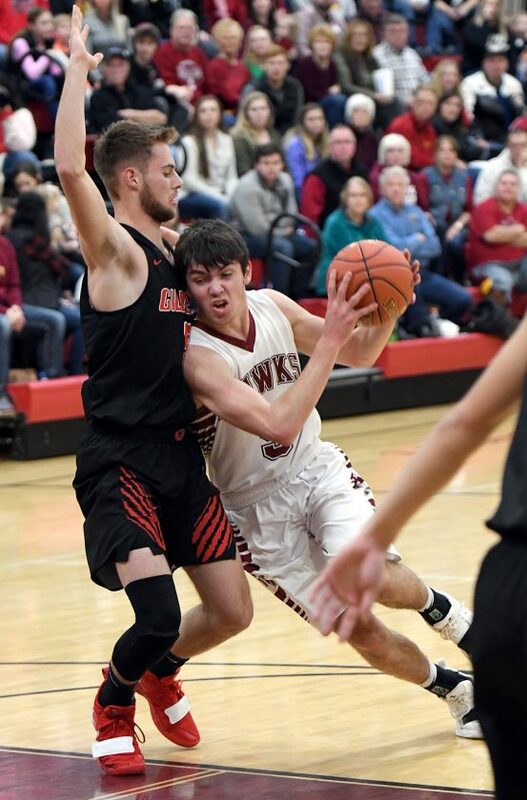 Berg, a senior guard, shrugged off a 1 for 4 start from the charity stripe and buried his final five free throws over the closing 40 seconds to help sixth-ranked (Class 2A) South Hamilton fend off 10th-ranked (3A) Gilbert, 67-63, in a fight for Heart of Iowa Conference bragging rights. 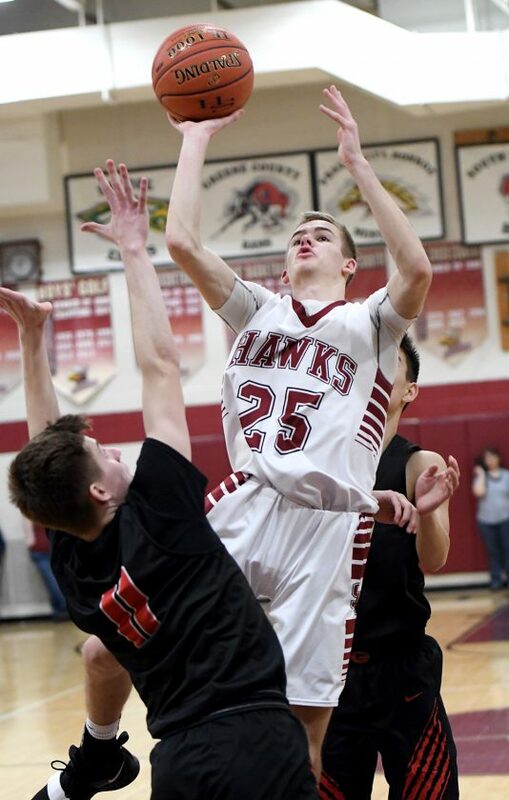 The Hawks (17-1, 12-1 HOIC) not only avenged their lone regular season loss in more than two years — a 70-65 Gilbert win back on Dec. 14 — but also took the outright league lead. They can wrap up their third straight conference championship and fourth in six years with a win over Nevada on Tuesday. And they have Berg’s free throws to thank. Cade Balvanz put Gilbert (14-4, 10-2 HOIC) on ice with one final free throw to make it a two-possession game with six ticks remaining. The on-court celebration began moments later. Logan Peters poured in 16 points to go along with six rebounds and two steals in the victory. Quinton Grove stepped up with nine points and seven rebounds. Balvanz finished with nine points and six caroms. 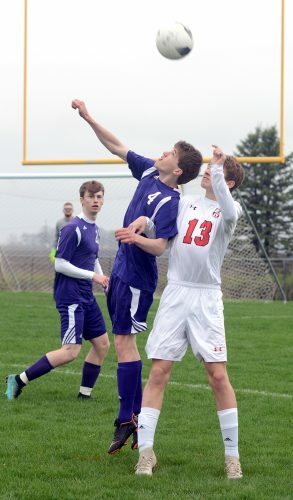 Bench players Sam Lewis and Aaron Hegland played understated, yet somewhat starring roles as well. With Peters relegated to the bench with three fouls in the first half, and Berg picking up his third and fourth fouls in the opening 49 seconds of the second half, Lewis and Hegland were called on to step up. They delivered with three and five points, respectively, but the grit they displayed in the highly-physical battle stood out. “Those two guys, they were ready and the moment wasn’t too big for them,” South Hamilton head coach Nathan Hill said. 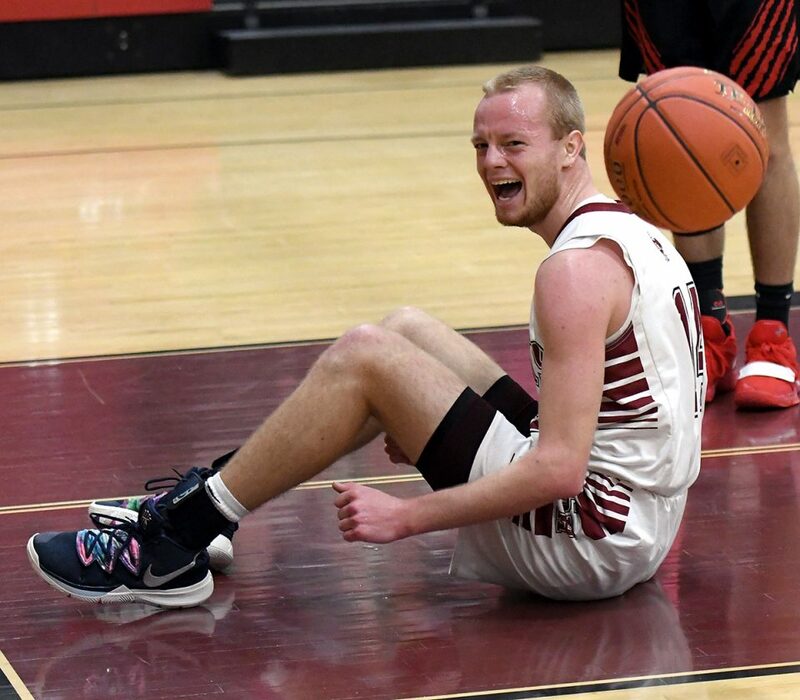 The lit crowd sat silently for 24 minutes between the third and fourth quarters though, as Hegland suffered a medical emergency in front of the South Hamilton bench. 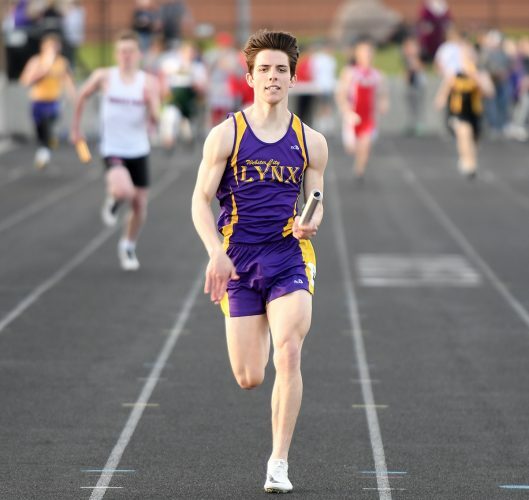 He was eventually taken off the floor and transported by ambulance to Mary Greeley Medical Center in Ames, but not before he waved Nathan Hill to his side to deliver some quick words in his coach’s ear. South Hamilton’s players retreated to the locker room during the break, but they were waiting at the exit as Hegland went out the door. Hegland was released from the hospital late Saturday night. 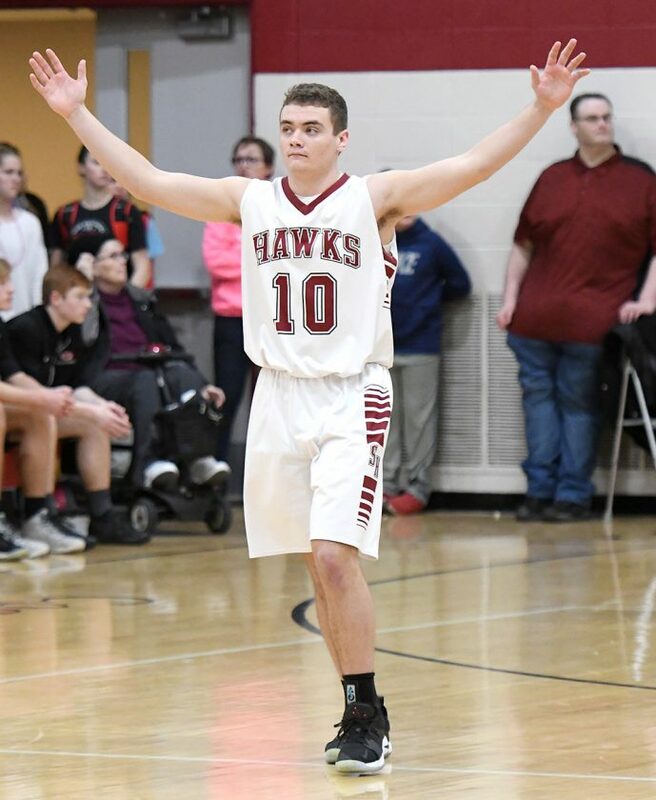 Ahead 48-45 entering the fourth quarter, South Hamilton briefly fell behind 62-60 with 2:26 to go, but a circus bucket by Peters as he was falling to the floor knotted the game at 60 and the Hawks never trailed again. Peters put them in front to stay at the line with 1:26 remaining. South Hamilton shot just 42 percent from the floor and 66 percent at the line, but a 25-8 scoring edge at the stripe offset 11 3-pointers by Gilbert. “We know we weren’t perfect, but we were extra focused down the stretch,” Conner Hill said. Conner Hill erupted for 10 first-quarter points to help the Hawks build an 18-11 edge, but Gilbert outscored the Hawks 22-14 in the second period to take a 33-32 halftime lead. 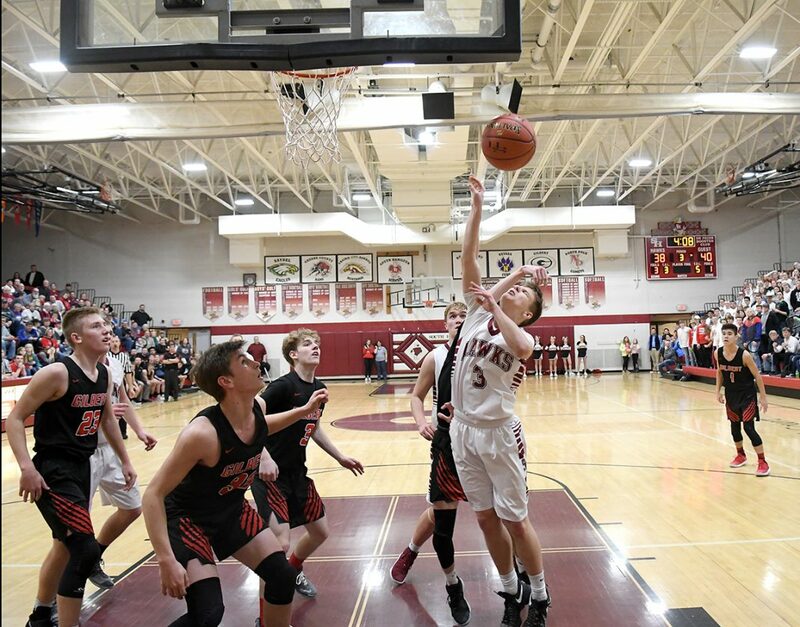 A drive and floater by Grove in the closing seconds of the third gave South Hamilton the three-point cushion heading into the final eight minutes. Gilbert’s Matt Ockey led all scorers with 21 points, 12 of them coming from behind the arc. His triple from the top of the key with 16 seconds to go pulled the Tigers within 64-63. Matt Barragy, who scored 10 points, took a 3 from the right wing that could have tied it with eight seconds to go, but it clipped the front of the iron and landed in the hands of Balvanz. Will Turner added 13 points for Gilbert before he fouled out late. 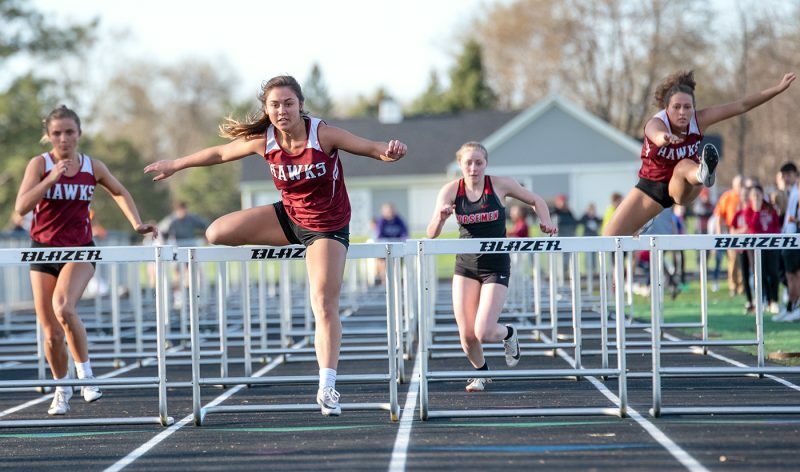 Gilbert (14-4, 10-2 HOIC) — Matt Ockey 7 3-4 21, Ben Simodynes 2 2-2 8, Matt Barragy 4 1-4 10, Will Turner 5 1-3 13, Jack Anderson 0 0-0 0, Tony Terrones 2 0-0 5, Tanner Henningsen 1 0-0 3, Jack Dresser 0 0-0 0, Jeff Rudman 1 1-2 3. Totals: 22 8-15 63. 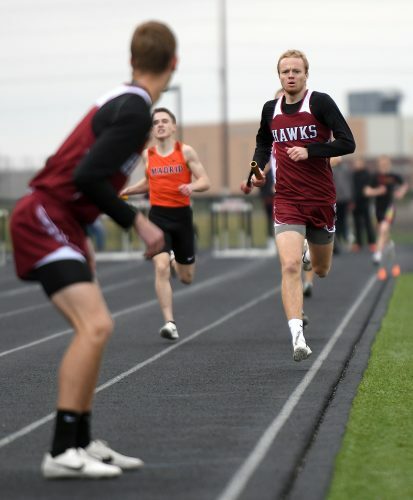 South Hamilton (17-1, 12-1 HOIC) — Aaron Hegland 1 3-4 5, Cole Berg 1 6-9 8, Sam Lewis 1 1-2 3, Logan Peters 6 4-9 16, Quinton Grove 2 4-4 9, Conner Hill 5 6-8 17, Cade Balvanz 4 1-2 9. Totals: 20 25-38 67. 3-point field goals — GIL 11 (Ockey 4, Simodynes 2, Turner 2, Barragy, Terrones, Henningsen); SH 2 (Grove, Hill). Rebounds — SH 34 (Grove 7, Peters 6, Balvanz 6). Steals — SH 5 (Hill 3, Peters 2). Assists — SH 9 (Hill 4). Turnovers — SH 7. Team fouls — GIL 24, SH 13. Fouled out — GIL: Turner.